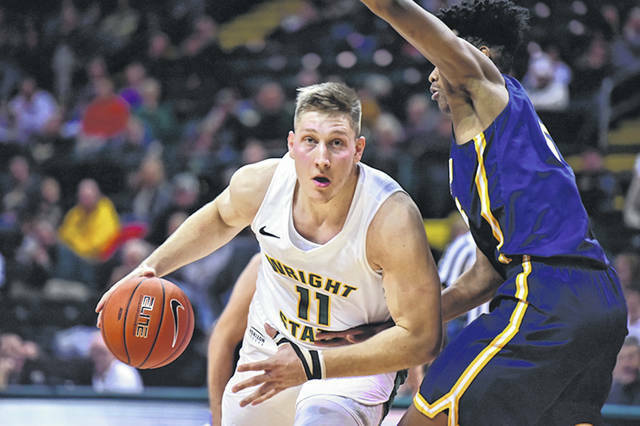 FAIRBORN — The Wright State men’s basketball team hosted one of the best teams from the Mid-American Conference and came away with a 84-74 victory over Toledo Nov. 14 at the Nutter Center. WSU dominated the boards 48-27 and also shot 46 percent from the field with 10 three-pointers. Wright State lived inside as well with 26 points in the paint to just 10 points for UT. Cole Gentry posted his career-high 30 points as the Raiders raised their record to 2-1. Loudon Love finished with his first double-double of the season at 14 points and 12 rebounds, while freshman Skyelar Potter also collected his first with 13 points and 11 boards. It was the first time a Raider scored at least 30 points since Grant Benzinger’s 31 points at Northern Kentucky last year. Bill Wampler also added 17 points. The scoring started in the first half with a Love layup but neither team went up by more than two points in the early going as WSU led 14-12 at the second media timeout. The Raiders did manage to score the next six points to grab a 20-12 lead and led much of the game. UT rolled back to cut the score to 24-23 but WSU took a 40-32 halftime lead. Gentry led the Raiders with 13 points on three three-pointers as Love added 10 points, while Wampler added nine. Love, Parker Ernsthausen and Potter each grabbed six boards. WSU shot 46 percent from the field and 41 percent from three, dominating the boards 23-9. The Raiders stretched their lead in the second half to as much as 14 points early at 53-39, and the Rockets were only able to cut it to eight points at 69-61 with 4:25 remaining. Potter had 11 points in the second half while Gentry led the way with 17 points. The Raiders will host North Florida 3 p.m. Saturday, Nov. 17 as part of the Cancun Challenge. Call 937-775-4934 for more ticket information. Fans can listen to Chris Collins and Jim Brown make the call of each game on Big 106.5 FM and the iHeart App. The Wright State men’s and women’s Coaches Shows will return Nov. 26 at Flyboys Deli in the Mall at Fairfield Commons. Women’s Coach Katrina Merriweather will be live with Chris Collins 5:30 p.m. and Men’s Coach Scott Nagy will be on 6 p.m. Fans can attend in person, tune in WONE, 980 AM or use the iHeart App. It will also be streamed live through www.wsuraiders.com.